The steps below walk through disconnecting a Google or Office 365 account. To disconnect an account connected via IMAP, reach out to your IT department for assistance. On the Connected Emails tab, locate the email inbox to disconnect and click Disable. In the dialog box, click Yes, disable it. Your email inbox will then display as Disabled, and will be grayed out. Select Remove to remove the inbox from your HubSpot account. In the dialog box, click Yes, remove inbox. Click Inbox Settings in the bottom left corner, then select Email. Hover over the email channel you would like to remove and click Delete. In the dialog box that appears, click Yes, delete. 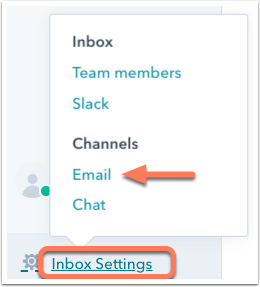 To completely disconnect your account, you'll need to navigate to your email account to remove the HubSpot connection. The two sets of instructions below walk through removing the connection in your Google account and in your Office 365 account. In the left sidebar menu, click Apps with account access. In the Third-party apps with account access section, select HubSpot, then click Remove access. In the App Permissions section, click Change app permissions. Locate HubSpot Sales and click Revoke. Navigate to Apps and services you've given access, then locate HubSpot and click Edit.